Capri. Just the name evokes a magical and surreal atmosphere, where the beauty of a wonderful landscape mixes itself with the artistic treasures of this island, the historical memories, legends and myths. 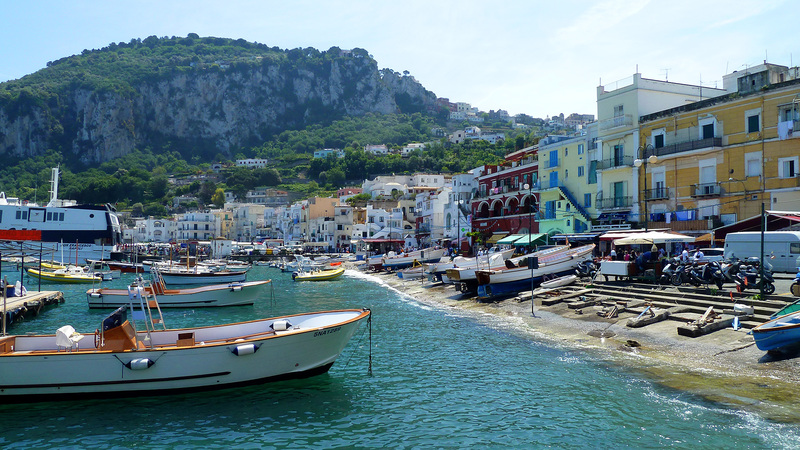 The myth of Capri, in fact. The myth of a small rocky island in the Gulf of Naples, a natural extension of the Sorrento Peninsula, already chosen by the Emperor Tiberius, who transferred here his own residence for ten years, becoming the center of the political life in the Mediterranean. He built here many villas, such as Villa Jovis and Damecuta. After a long period of isolation, during which the island was often sacked by the Saracens, the myth of Capri flourished during the XIX century, when it became one of the stop of the Grand Tour, the cultural journey that young and intellectuals of northern Europe had to make in Italy, to discover the greatness of the past civilizations. From that moment this small island became the catalyst of a cultural and artistic fervor that lasts until today. Magical, glamorous, fashionable, charming, cheerful, unique, unforgettable…you lose track of all the adjectives commonly used to describe Capri. Perhaps it is loves all around the world for the vitality of the beautiful square and streets, the superb scenery, the blue sea and the high coast where romantic caves and grotto are hidden (such the Blue Grotto), the impressive Faraglioni, the peace that regenerates the soul. Or because Capri is simply…Capri. This is the essence of the myth of Capri.